FizzBuzz is an old coding test used to make sure that interviewees are capable of solving basic coding problems. Write a program to count from 1 to 100, when it is on a multiple of 3 have it print Fizz, when it is on a multiple of 5 have it print Buzz. If it is on a multiple of both 3 and 5 have it print FizzBuzz. When I came across FizzBuzz and it’s solution I thought the same thing that I think when I see any application: How can I port this to Android? So I decided to make a version of FizzBuzz on Android which would really Fizz and Buzz! So here it is: FizzBuzz for Android. The UI in android cannot be written to directly from an Activity’s onCreate or onResume methods, however a background function should never execute UI code. Also when sound files are played they are played by a background service and the system for checking their completion is complicated and better suited to longer audio files. Fizz and Buzz have static lengths and I never want to play Buzz before Fizz, so a logical solution is to wait for 250ms after launching Fizz before launching Buzz. Also in order to have the lines arrive in a steady order and not have any audio play over other audio I determined that it would be best for every line to take 1 second. Both the wait for Buzz and the 1 second line wait require a sleep or wait, neither of these functions should be run in the UI thread. The solution I found was to launch a Runnable as a thread. The runnable contains the logic and launches the Fizz sound, it also uses another thread to launch the Buzz sound. When the runnable needs to output a new line to the table it uses runonuithread(). The Audio samples I used in FizzBuzz were clipped from files on SoundBible.com and the Source Code for FizzBuzz is available on GitHub. It’s amazing how much you can learn doing a simple little project like this one. Lots of college stuff was going on, so I wasn’t able to work on Shortest Walking Route for a while. Now thankfully things have died down. When the user chooses “Capture Route” on the Home Screen, they should be asked where they are going. When they get to that location Location Service should automatically turn off and play a sound to let the user know. 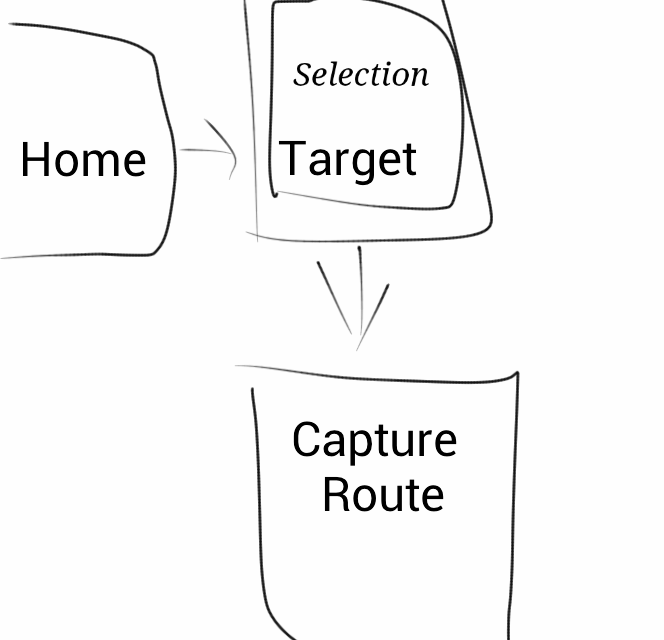 Idea 1: When the user clicks on “Capture Route” it opens Target Selection Activity (an activity with a big map, like Display Routes), which shows the user a Selection List (like the one currently in Display Routes Activity). If the user chooses to create a new target, then the Selection List dissapears and they choose a location in the view underneath. Upside: as the use taps on different potential selections I can have the map behind the Selection List zoom to the location they are choosing, this should make it easier to be sure that the right location is being chosen. Idea 2: When the user clicks on “Capture Route” it opens a Selection List dialog over the Home screen, in this dialog the user can choose one of the saved targets ore choose to create a new target. 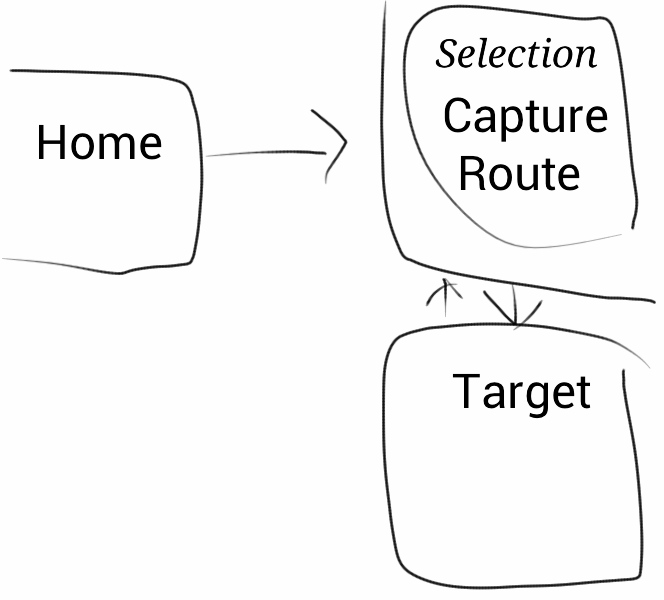 If the user chooses an existing target they go on to Capture Route, if they choose to create a new target they are brought instead to map where they can choose a location to be a target. Upside: If the user is frequently choosing the same targets then this will skip the Target Selection screen which will make the process of starting a Route Capture quicker. 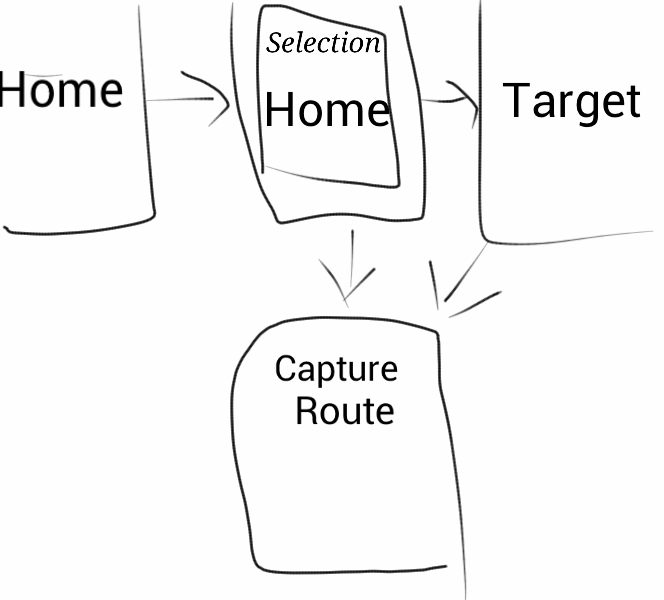 Idea 3: keep the relationship between Home and Capture Route Activity the same, show the Selection List in Capture Route Activity and pass the user out to Target creation if they they opt to add a new Target. Please let me know what you think of these ideas, and if you have any other ideas I should be considering.